Deciduous shrub, sometimes prickly, the leaves divided with 3-5 leaflets, toothed, downy underneath, the flowers white in racemes, followed by edible red fruits. To 2m. [RHSD, Hortus]. Species of raspberry are common over most of the world, including Australia, but the species from which the European edible raspberry is derived is Rubus idaeus L. subsp. vulgatus, and this is the only plant that concerns us. Rubus idaeus is named after Mount Ida in Asia Minor, according to the Ancient Greeks, the home of the Raspberry. ‘In Europe domestication of the raspberry was first mentioned by Roman writers in the 4th century, but for a long time they were still generally collected from wild plants. The fruits were eaten or used for flavouring drinks, the leaves for making tea. By the 16th century a number of European writers noted that raspberries were cultivated in gardens, and by the 17th century different forms were described, including those with red, yellow and white fruits, and thornless cultivars. Selection for larger fruits had made considerable progress by the end of the 18th century, and in 1823 the Horticultural Society of London reported that it had 23 cultivars in its collection. Over the next hundred years nurserymen introduced more selections and chance seedlings’. [RHSD/1999]. White and yellow-fruited varieties have been available for centuries, possibly derived from other species, and were grown at Camden Park. However, in the Hortus they are considered varieties of Rubus idaeus. I have seen white and red-fruited raspberries growing wild, side by side in old Warwickshire hedgerows. 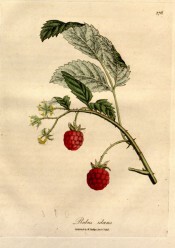 The illustration of the Wild Raspberry is taken from William Woodville’s Medical Botany [Medical Botany vol. 3, pl.176/1832]. Five varieties of raspberry are listed in the catalogues or in other records. The ‘Common Red’ appeared in 1843 and the ‘Common White’ in 1850, with two others, ‘Antwerp’ and ‘Fastolff’ added in an Addendum to the 1857 catalogue. ‘White Antwerp’ was obtained from South Australia in 1845. These are all treated separately.